This blog has originally been posted on ircwash.org. How can the concept of learning in the rural water supply system in Uganda be conceptualized and modelled? This is the challenge I’ll be working on for the next 5 months at IRC. I’m a student at Delft University of Technology, following the master Systems Engineering, Policy Analysis, and Management. At my faculty, we learn to look at the intersections between technical systems and social systems and design for complex systems. Imagine a red car. Is this car complex or complicated? In common language, these words are often used interchangeably, but in the field of Complex Adaptive Systems (CAS) they represent different things. A red car is a complicated thing. It consists of thousands and thousands of little parts that are all in some way connected to each other in order for the car to move. Complicated. Now imagine a person in the same red car in between hundreds of other cars. Complex or complicated? Right, complex. The person in the car has a destination, the person can be in a hurry, can be sad, tired, exhausted. The car next to it is similar: a person with a destination, a mood, and a route. All cars in traffic make decisions and the result of all these individual decisions and their interactions determine the outcome of the system: a flow of cars, a traffic jam, or even an accident. Emergence is in my view the most interesting part of a CAS. Emergence is the phenomenon of interesting, non-obvious consequences of the interactions between things, in this case red cars, that make decisions. Take the traffic pattern occurring when cars decide to hit the brakes. Nothing special has to happen if one car decides to break. However, when there are many cars on the road that react on the action of that car then, minutes later, a traffic jam might emerge. The traffic jam, however, is not the result of the first car hitting the brakes. It is also caused by the next car hitting the brakes, and the next one, and every other interaction between all those cars on the road. Observing the emergent properties of a system means observing the system as a whole. This is different to the more traditional perspective on systems thinking, where systems are decomposed and each part is analyzed in order to understand the working of a system. This would work very well in complicated systems. CAS theory tells us that you might lose very determining properties of a system when you decompose it. Back to the traffic example: decomposing the system to individual cars, for instance, makes it difficult to discover the cause of the traffic jam: cars that break in reaction to other cars breaking. parts, as well as other people and organizations, determine the outcome of the system. The decisions and their effect are bounded by the structure of the system, for example by rules, laws, and culture. In the traffic example the same is applicable: traffic rules, infrastructure and norms on the road impact the system’s outcome. It is even more complex when different parties have different goals or different views on how to reach a goal – unmistakably the WASH sector. CAS in WASH: the system is observed as technical parts, stakeholders and their interactions that are bound by characteristics of the sector. They both determine the outcome of the system, in this figure, it is measured in terms of Water Service Levels. 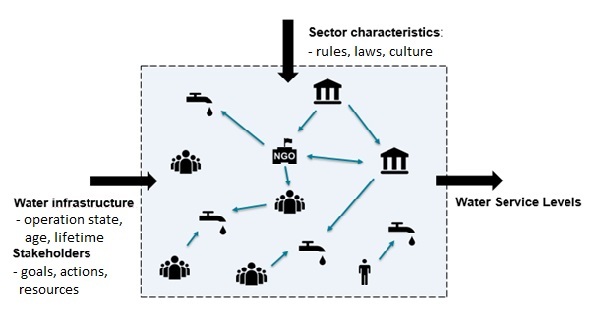 Now, this perspective is not completely new to the WASH sector – quite the opposite is true, take for instance the alignment of donor efforts or research into delivering whole systems change. How the CAS perspective turns out to be any good for learning in the rural water supply system in Uganda I’ll write about in the next blog.